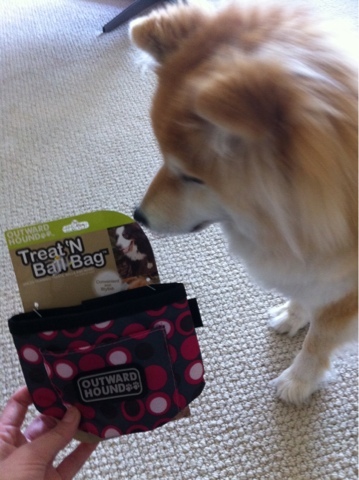 Ever since I started agility class, I've been looking for a good treat bag. I got one from the pet shop, but wasn't really satisfied by it. Why? The cloth opening sometimes make it hard to reach for food. 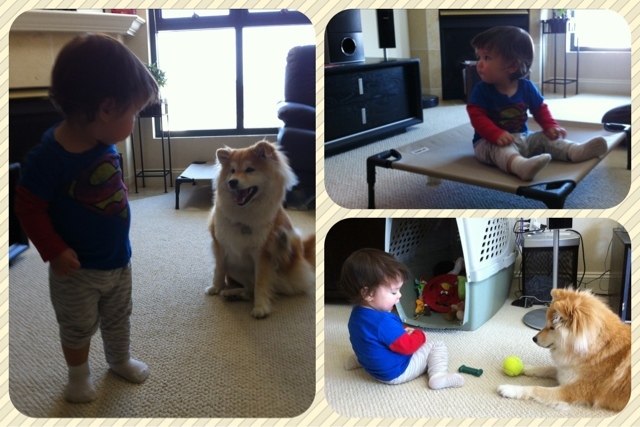 If I fold the cloth over, then the food will spill out when I start running. It's also hard to clean if I need to bring wet/greasy treats, like meat balls, cheese, or hot dogs. 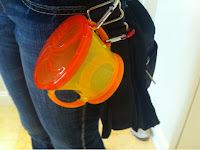 During Maya's last playdate with baby HM, one of HM's accessories caught my attention: Munchkin Snack Catcher. 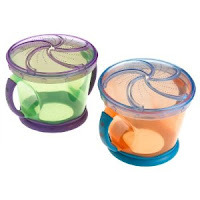 It's basically a small cup with a plastic lid that has soft flaps, which is designed so that toddlers can reach in for snacks but food won't spill out if knocked over. This is exactly what I need! I went to Target the next day and got myself a pack of two right away. For those who may be interested, here are some pros and cons. Cheap (about $6 for 2). Easy to reach in for the treats. Food stays put when running and jumping around. The two handlers make it easy to attach to a bag or on the waist. The opening might be a bit too small for those with bigger hands. Does not come with a stay fresh type of lid that seals the top, but I did find a soft-spread butter lid that works well with it. I'll just have to remember not to throw it away when I finish the butter. Can only hold one type of treats. 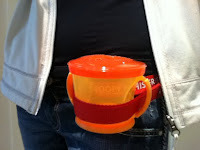 I guess I can tie both cups on my waist if I have to, though it'll make me look really silly. 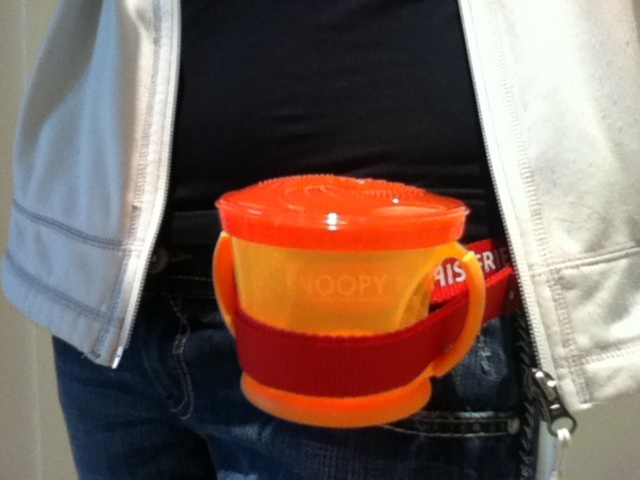 I've been using it for more than a week and really loved it. It might not be for everyone, but definitely servered my needs.